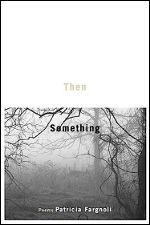 As the cover suggests, Then, Something by Patricia Fargnoli offers a contradiction, or juxtaposition, of things that are and things that are not. Blurring lines between reality and imagination, between what is and what is not, Fargnoli’s poems challenge the reader to ponder, question, and settle into the quiet unrest of unknowns. and a memory of the love you have been calling back—but you will soon forget. release breath. Leave behind the scars on your finger, your thigh, the long one over your heart. As these excerpts demonstrate, Fargnoli has a passion for the long line. Most poems extend to the far edges of the page, prose style, within tight verse. The white space between two line stanzas is deceiving; these are not light, quick lines. Fargnoli’s verse is fluid, but it is complicated and full of weighty questions. and a widow my age claimed I’d changed her life. Such praise, hard to let in, harder to let go. of me except what I’ve written? Indeed, what do we know but that which we are presented? What can we surmise of Fargnoli’s narrator or, perhaps, the poet herself? Everything. And nothing. As it flows in Then, Something, we, the reader, are given ample opportunity to dig deep, reveal layers, and find treasures of personal knowledge; yet, we’re left behind, most often on the sidelines, the margins, in briefly encountering an in only to be made aware that our experience was a mere hint at Fargnoli’s experience. Like the man who handed off paragraphs after a reading, we are in the audience. We do not play an active role. We observe. We question. We ponder. The only answers we are given in Fargnoli’s tightly weaved verse and prose like enchantments are ones we presume for ourselves, ones we think we understand. Sometimes, it feels as if I’ve said goodbye to everyone. beyond my vision and somewhere dissolve into rain. Fargnoli’s world is complicated, beautiful, moving, and impenetrable. Her poems are the rain. We are the clouds. Lori A. May is the Founding Editor of Poets’ Quarterly. Visit her website at www.loriamay.com.